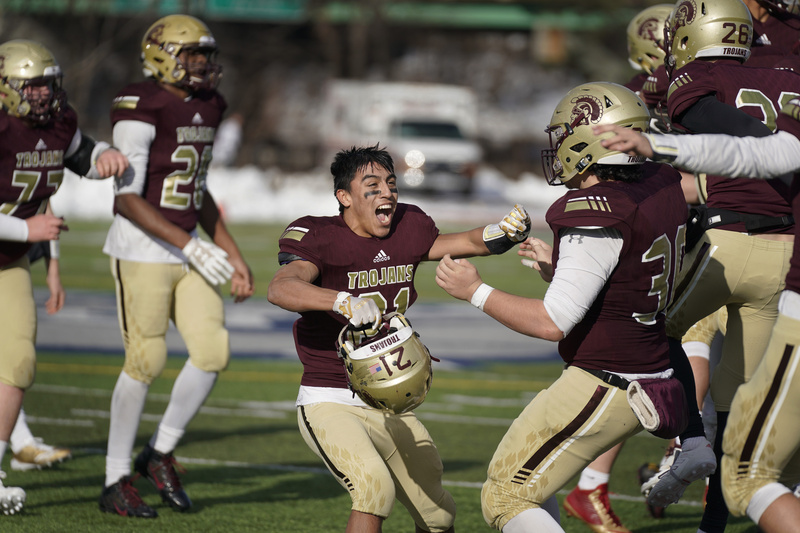 Thornton Academy's Anthony Bracamonte celebrates with his teammates after a spectacular effort in the Class A football state championship game on Saturday. 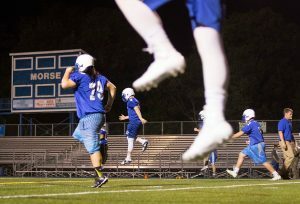 Bracamonte scored four touchdowns, rushed for 100 yards and had 144 yards receiving as the Trojans beat Portland 49-14. 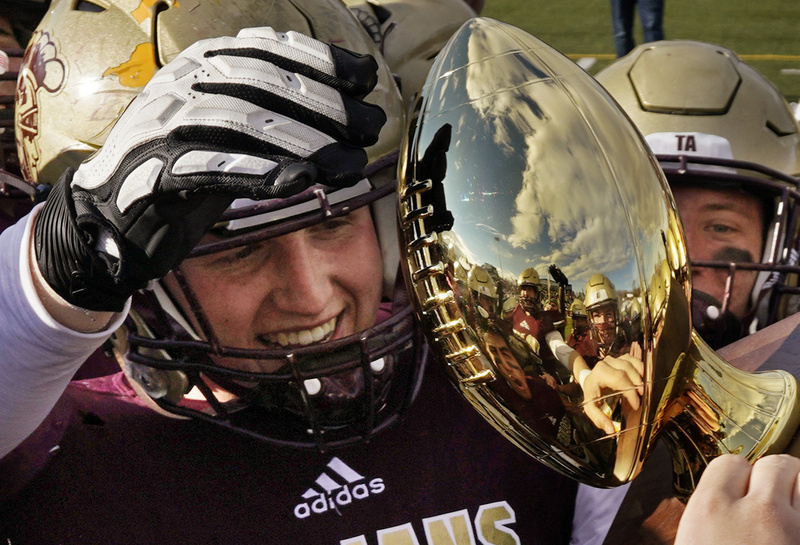 Ethan Logan, center and Anthony Bracamonte, below, and other Thornton Academy players hold the championship trophy after the Trojans beat Portland 49-14 to win the Class A football state championship game Saturday at Fitzpatrick Stadium in Portland. 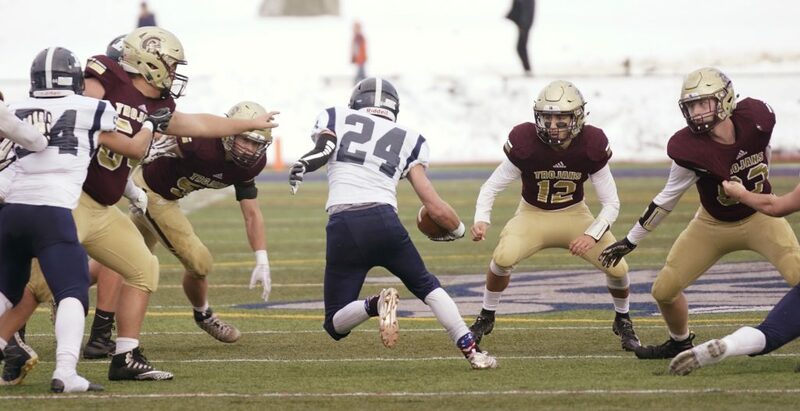 Thornton Academy's Anthony Bracamonte rushes to celebrate with his teammates after a spectacular effort in the Class A football state championship game on Saturday. 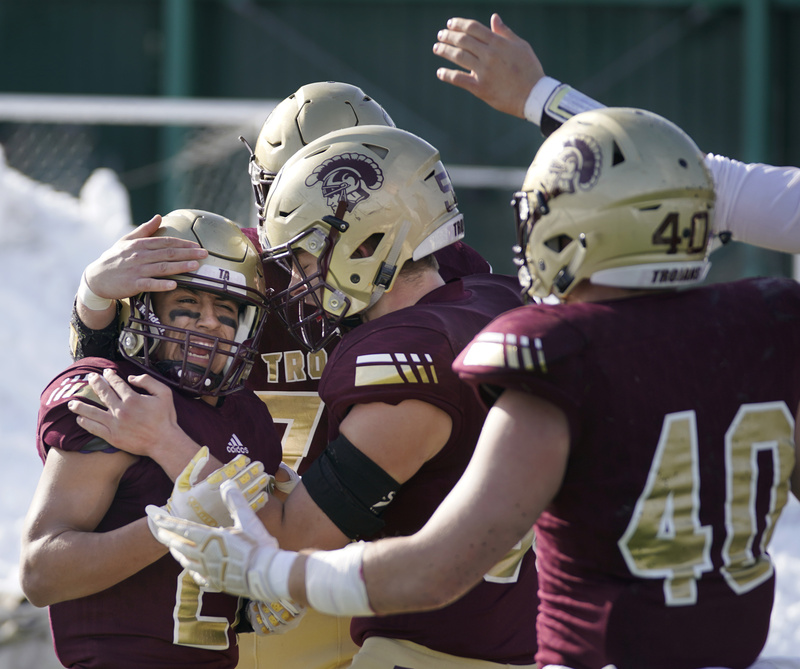 Bracamonte scored four touchdowns, rushed for 100 yards and had 144 yards receiving as the Trojans beat Portland 49-14. 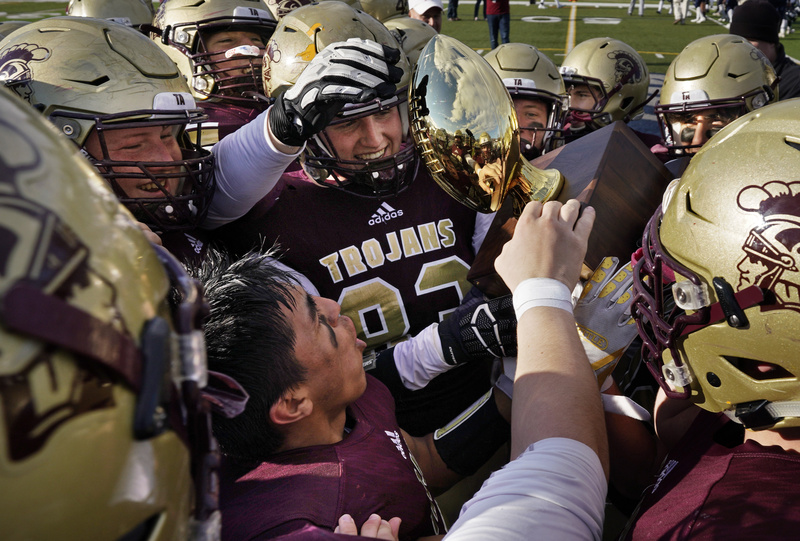 Thornton's Ethan Logan, left, holds the championship trophy after the Trojans beat Portland 49-14 in the Class A football state championship game Saturday at Fitzpatrick Stadium in Portland. 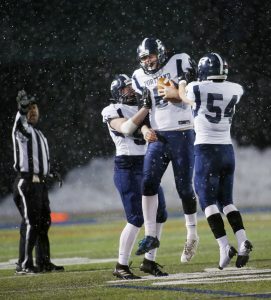 Anthony Bracamonte, left, and Ethan Logan of Thornton Academy celebrate after the Trojans beat Portland 49-14 victory in the Class A football state championship game on Saturday at Fitzpatrick Stadium in Portland. 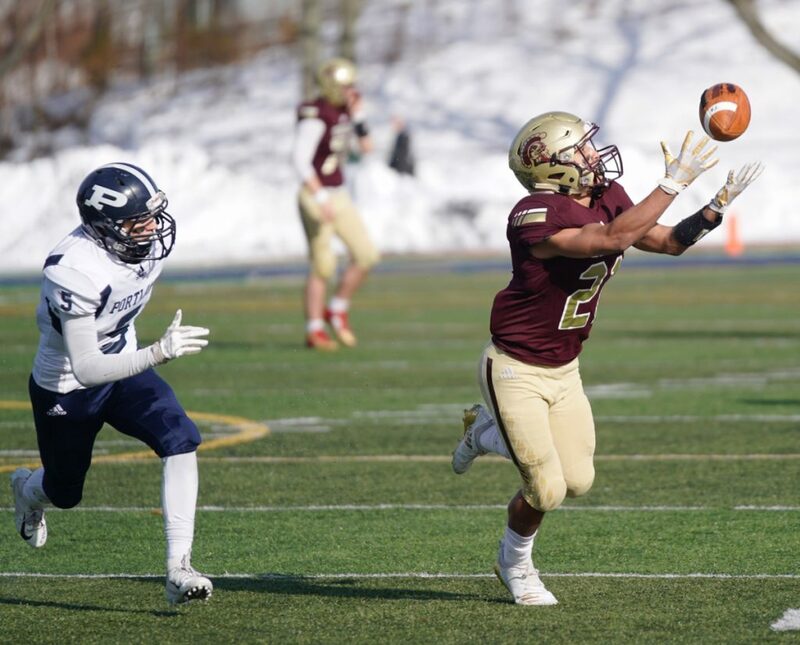 Thornton Academy's Anthony Bracamonte hauls in a touchdown pass on the Trojans' third play from scrimmage Saturday during the Class A state championship game at Fitzpatrick Stadium. Bracamonte scored four TDs in Thornton's 49-14 win. 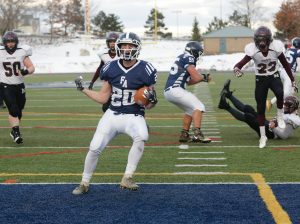 Zack Elowitch of Portland fends off Thornton’s Jackson Cochrane as Elowitch runs in Portland’s only touchdown in the first half of the Class A football championship. 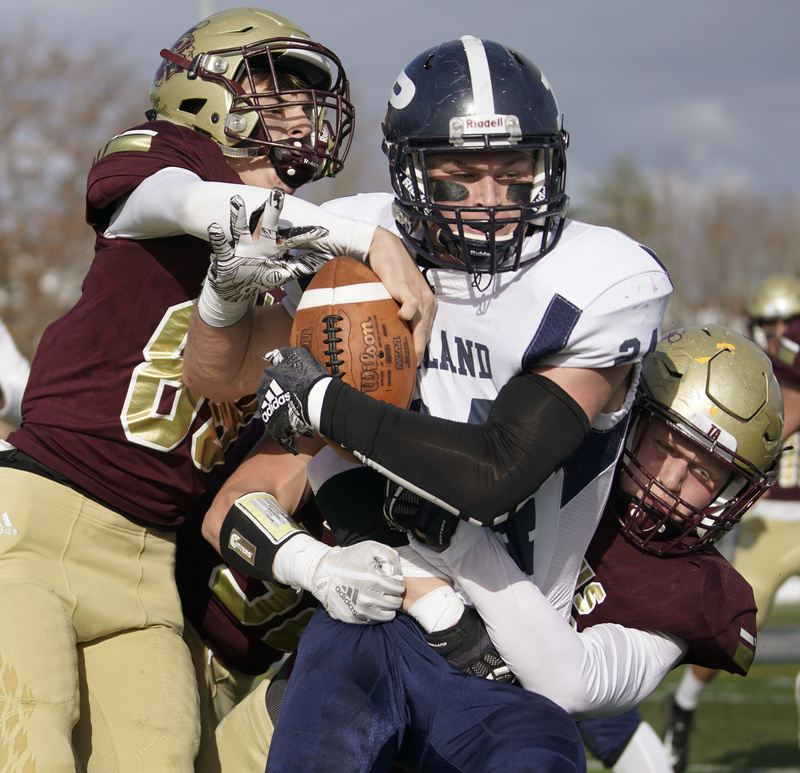 Thornton Academy’s Jackson Cochrane, left, and Ethan Logan, right, work to pull down Portland's Zack Elowitch during the Class A football state championship game Saturday at Fitzpatrick Stadium in Portland. Thornton Academy won 49-14. 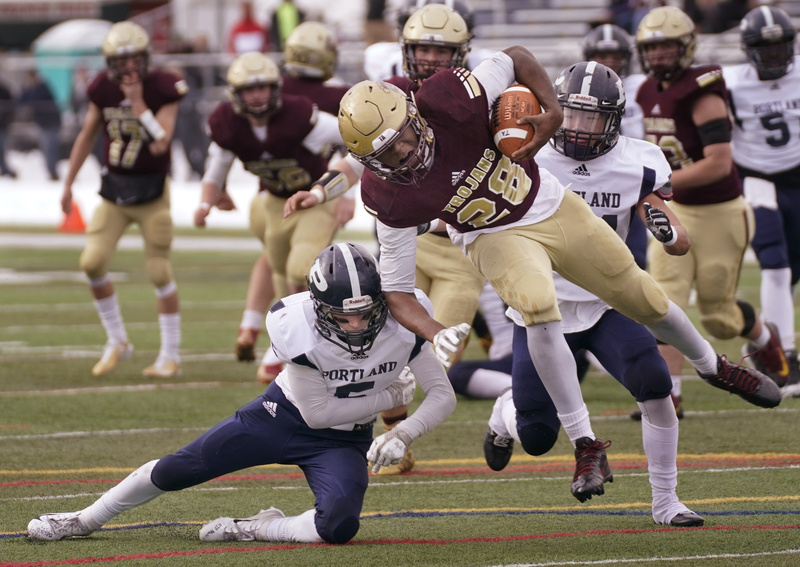 Portland's Ben Stasium tries to tackle Thornton Academy's Anthony Bracamonte after Bracamonte hauled in a pass during Thornton's 49-14 win in the Class A state championship game on Saturday at Fitzpatrick Stadium in Portland. 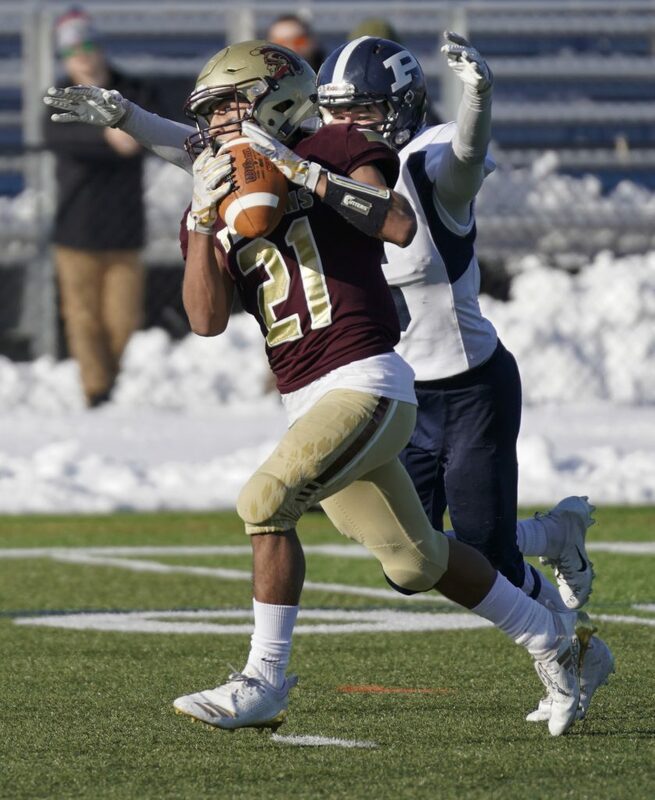 Thornton Academy's Eli Arsenault nearly intercepts a pass intended for Ben Stasium of Portland during the Class A state championship Saturday at Fitzpatrick Stadium in Portland. Thornton Academy won 49-14. 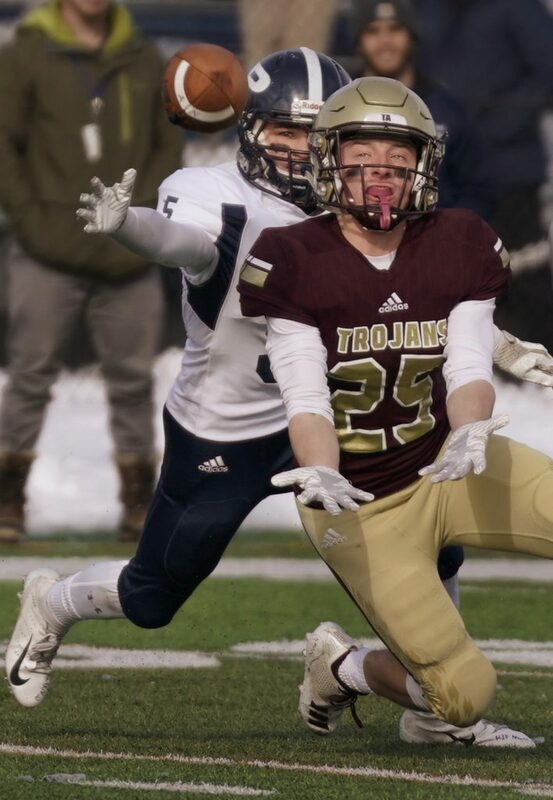 Portland’s Ben Stasium upends Isaac Ofielu of Thornton Academy during the Class A state championship game Saturday at Fitzpatrick Stadium in Portland.  Thornton Academy won 49-14. 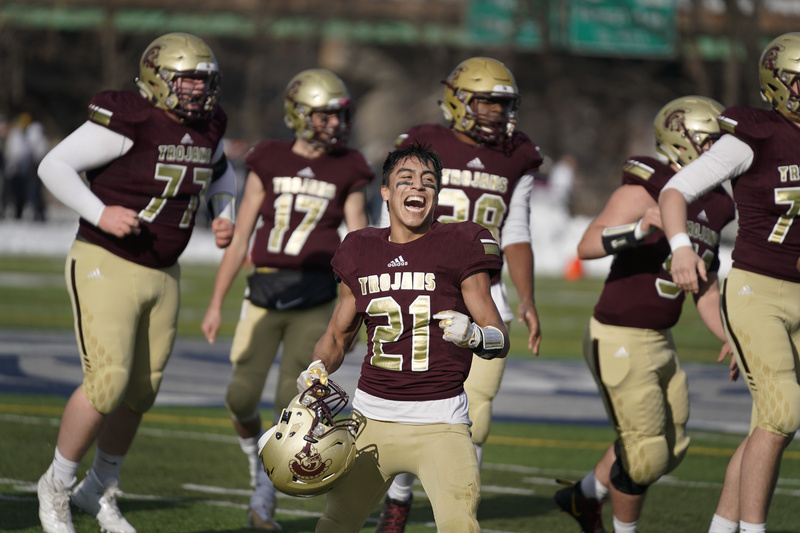 Anthony Bracamonte and his Thornton Academy teammates celebrate Bracamonte's first touchdown early in the first quarter in the Class A state championship Saturday at Fitzpatrick Stadium in Portland. Bracamonte scored four touchdowns and Thornton Academy won 49-14. Portland's Zack Elowitch looks for an opening through a host of Thornton Academy defenders during the Class A state championship game Saturday at Fitzpatrick Stadium in Portland. Thornton Academy won 49-14.